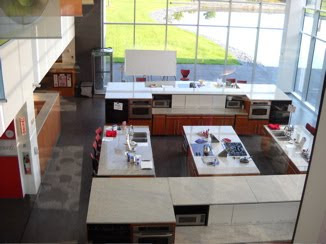 While I liked Kraig's guess yesterday that this was a new kitchen Bo built for me, this amazing kitchen is actually Betty Crocker's kitchen at the General Mills company in Minneapolis. 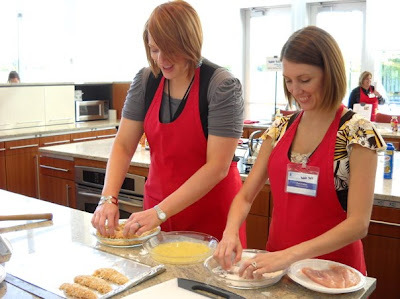 I was one of a group of lucky bloggers who were invited to General Mills' Table Talk event to find out more about General Mills, learn some ideas and tips for making dinners easy and fun, and share our thoughts. It was a fabulous trip and I learned so many things! Not only was I able to see the Betty Crocker kitchen, where they cook and test new recipes, I was able to cook in the Betty Crocker kitchen! 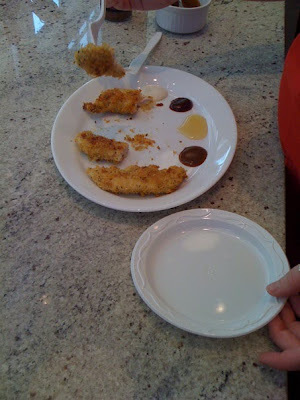 My group made Oven-Fried Chicken Tenders and they were scrumptious and easy! The shot of the kitchen above is only a portion of the kitchen. There are many more stations -- all equipped with sink, stove, rangetop, microwave and individual refrigerators. The huge windows allow in a ton of natural light, which makes the kitchens bright and cheery. Did you know they have one person on staff who ONLY does grocery shopping? Every day she heads out to regular grocery stores to purchase groceries for all the recipes they prepare. This way, they make sure that the ingredients they choose are easily available to the average cook. I wonder if that employee dreads her own grocery shopping trips? If you want to make them yourself -- here's the recipe straight from Betty Crocker's kitchen! Heat oven to 425 F. Line cookie sheet with foil, spray with cooking spray. Bake 15 - 20 minutes, turning once, until chicken is no longer pink in center and coating is golden brown. Serve with dipping sauce. Even though I was only at General Mills for a few hours, I learned so much that I have a bunch of posts planned for the next couple weeks. I also did an interview about my experience for the Moms Love Shopping podcast that should go live tomorrow. Come back over the next couple weeks and read more about my experiences! Did you play Wordless Wednesday yesterday? If so, don't forget to tell your story today & link to Tell Me Thursday! How fun! What an opportunity you had. I am not sure I would like the grocery shopping job! I send my husband! OMG that is so cool. I would love to go cook in Betty Crocker's kitchen. That recipe looks super easy so I'll have to try it out one day while we are sitting around watching football games. sweet! Those were so good! Oooh wow - what a great post. Looks like fun and a great recipe too! Congrats! I forgot that your back yard is way cooler than what is pictured in the background!